Mission components give ATF important information about the basic orientation of forces. 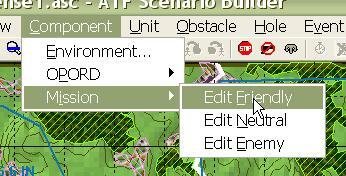 It also tells Armored Task Force what conditions the player must meet in order to win the game. 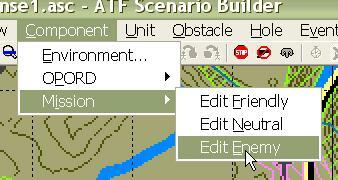 Finally, it is one of the places where the Display Name for the scenario is located (the other is with the OPORD), and the short description of the scenario which is displayed in the opening dialog of ATF, when the player is selecting a scenario. There are three Mission components: Friendly, Enemy, and Neutral. Only the Friendly component needs to be completely filled out. The only important data for the Enemy and Neutral Mission components is the 'Global Direction'. The other entries are not currently implemented or used. The Friendly Mission is the most important Mission Component. It defines the victory conditions, the win-loss messages, the scenario description, and the friendly global direction. 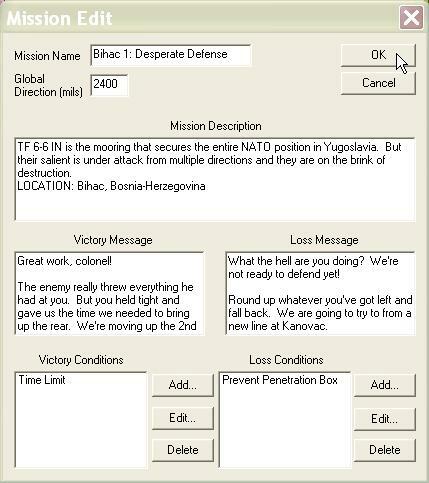 In this example, we are going to set victory conditions for a defensive scenario. An attack victory condition will use the 'Objective Ellipse' to define the ground the player must control to win, instead. 1. Select 'Edit Friendly' from the 'Mission' sub-menu of the 'Component' menu. 2. 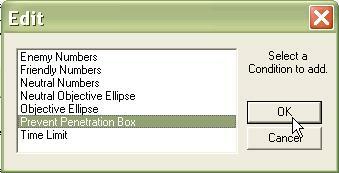 Fill out the basic data in the Mission Edit dialog. Mission Name. This is filled in automatically by the Scenario Wizard. 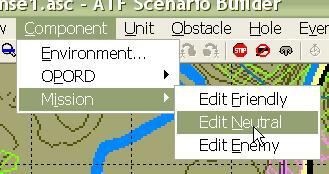 It is the name displayed in the title bar of Armored Task Force when the scenario is loaded. If you wish to change it, you must also change the value in the OPORD dialog. Global Direction. In mils (0-6400, 0 is north, clockwise angle). This is the basic orientation direction of the friendly player's force (the direction of attack or defense to face the enemy). Victory Message. 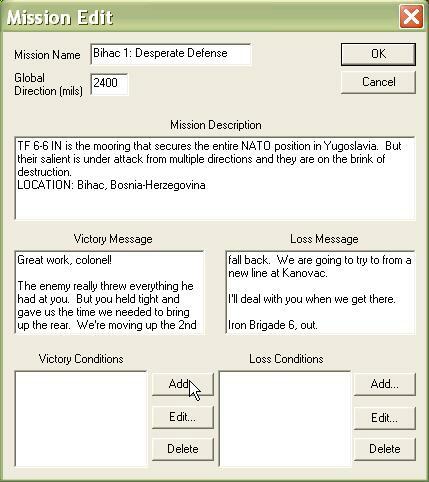 This is the message displayed in the Results window if the player wins the mission. Loss Message. 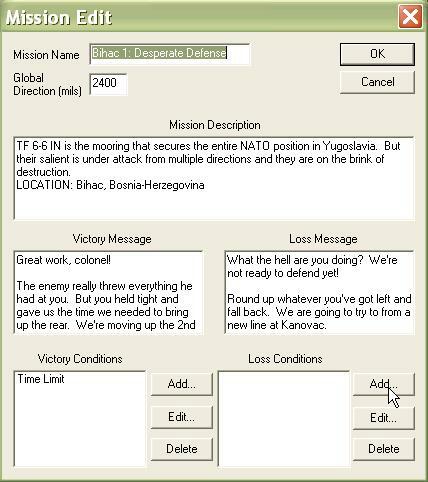 This is the message displayed in the Results window if the player loses the mission. 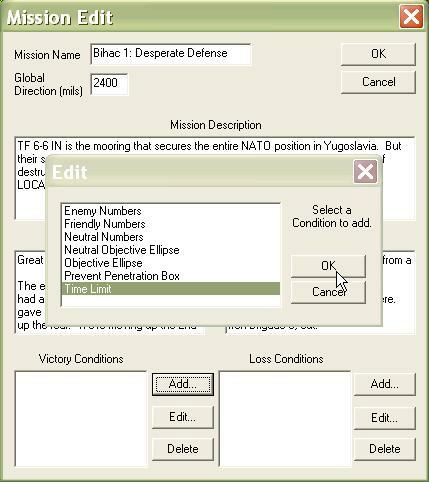 After the form is completed, select 'Add' to begin adding Victory Conditions. 3. When the 'Time Limit' condition is placed in the Victory Conditions box, it means that the player must 'hold on' until the defined time. When it is in the Loss Conditions box, it means the player must achieve the victory conditions before that time, or he cannot win. 4. Enter the time limit. Since this is in the Victory Conditions box, it means that the player must defend beyond this time. 5. Now we are going to add the Loss Conditions. Before this step, we need to define an 'Event Box'. An Event Box is just a box defined on the ground. It is used by conditions to look at regions of the map. If you need to define an Event Box, select OK, define the Event Box, and then re-select the 'Edit Friendly' function. 6. The 'Prevent Penetration Box' condition counts the number of enemy units in a defined Event Box and is 'true' when the enemy count is equal to or exceeds the defined number. 7. Fill out the form for the Prevent Penetration Box. Penetration Box. This is the name of the 'No Pen Line'. 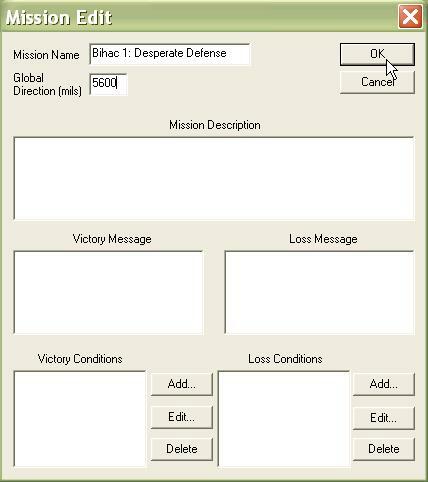 It is displayed with the Mission Objectives and Results in the 'Results Window'. Enemy Maneuver Only. When this box is checked, Armored Task Force will only count enemy maneuver vehicles, not non-maneuver vehicles such as engineer and artillery units. 8. We're done! Select 'OK'. The only values used in the Neutral and Enemy Mission Components are the Global Directions. Even if you do not plan on adding Neutral units to the scenario, it is a good idea to fill in the Global Direction (use the same direction as the Friendly Global Direction), in case someone modifies your scenario by adding Neutral units later. 1. Select 'Edit Neutral' from the 'Mission' sub-menu of the 'Component' menu. 2. You do not have to fill out the entire Mission Edit dialog. Mission Name. This is filled in automatically by the Scenario Wizard. It is not used by Armored Task Force. Changing it has no effect. Global Direction. In mils (0-6400, 0 is north, clockwise angle). This is the basic orientation direction of the neutral units (the direction of attack or defense to face the enemy). It will normally be the same as the Friendly Global Direction. 3. Select 'Edit Enemy' from the 'Mission' sub-menu of the 'Component' menu. 4. Again, you do not have to fill out the entire Mission Edit dialog. Global Direction. In mils (0-6400, 0 is north, clockwise angle). This is the basic orientation direction of the neutral units (the direction of attack or defense to face the player's forces). It will normally be 3200 mils different from the Friendly Global Direction.